I was disappointed and alarmed to see the landfill areas in Abu Dhabi and the amount of food being wasted. This may have harmful effects on our environment. I wanted to draw the attention of the younger generation towards this and suggest some small and humble steps to minimise the issues. We started a campaign at Sunrise English Private School, on smart waste management last year. As an active member and the Sustainable School’s Initiative co-coordinator, I always thought of doing something for the benefit of the community and started a campaign along with my students. As the initial step, students collected waste from their homes and from the community on a daily basis. These were put in a Smart Cara machine, which converts waste to manure within a few hours. This organic manure is utilised in the school’s organic farm, sold to parents during open house meetings and the rest is given to Al Ain farms through a waste management initiative from Masdar City. We highly appreciate and thank Masdar, which has always guided us in this campaign. A Masdar City representative demonstrated the working of the machine and how it can be successfully implemented in the school. We bought the machine for the school in the month of April 2018. The machine converts the waste from the school canteen and from homes into organic compost with minimal electricity consumption. This technology is easy to use and uses innovative multiple carbon filters to eliminate foul smells during the composting process. It works through a revolutionary use of the sensor system. Sensors automatically measure the food waste by volume and by checking dehydration levels at regular intervals, thus saving time and energy. 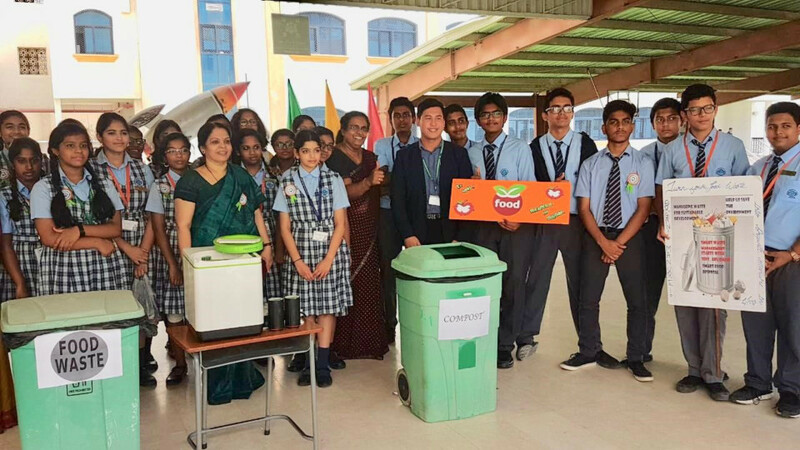 “This Smart waste management project of converting organic waste into compost is an inspirational initiative taken to encourage students into caring for the community along with waste management. 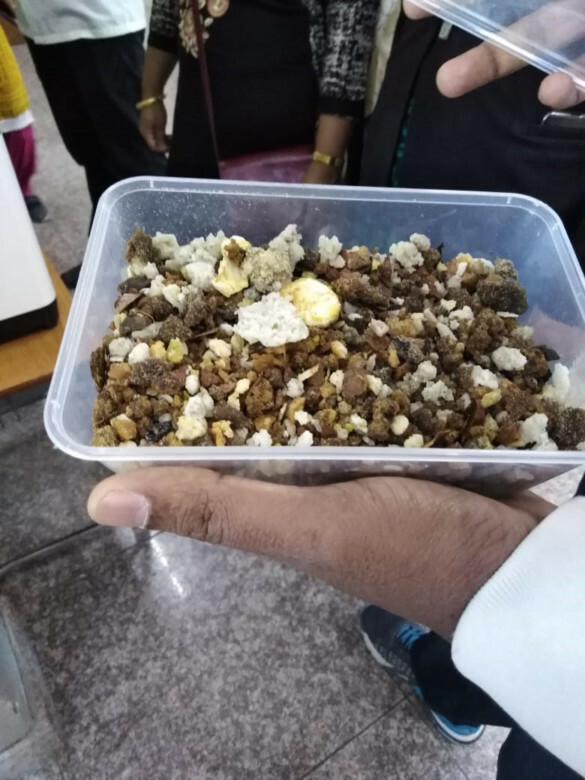 It also focuses on changing waste to compost in a matter of hours,” said Gaiety Chacko, a business intelligence analyst at Etihad Airways, one of our student’s parents. 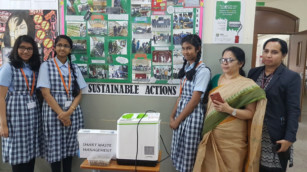 “I am truly inspired by this project and started waste segregation in my home,” said Kalyani Santhosh, an eighth-grade student. “I am very happy to be the part of this project,” added Bhoomika Ujjainkar, another eighth grader. Our club members collect waste on a daily basis and produce manure, which is used in our school’s organic farm. A Masdar city representative comes to collect the manure, which is handed over to Al Ain farms on a weekly basis. We are planning to conduct more awareness campaigns and seminars at neighbouring schools for the benefit of the community. It is a small and humble step from our school to minimise the landfills in UAE. The school always follows the path paved by Shaikh Zayed Bin Sultan Al Nahyan in supporting sustainable development. Three million tons of food are wasted annually in the UAE. The country is looking to become the first in the region to achieve zero food waste. The entire global food waste generates 3.3 billion tons of greenhouse gases. We are responsible for our planet and therefore need to protect it and reduce the organic waste sent to landfills. We want to guide, enlighten and motivate our younger generations about our environment and to make it a beautiful place to live on. All our efforts came to fruition only because of the endless support and encouragement from our Principal Thakur S. Mulchandani and our Vice-Principal Sheela John. Since the machine is a little expensive, we would like the authorities to supply them in the community either freely or on a subsidised rate so that all the houses in the UAE can be smart sustainable households. I think that every teacher and every student can make a difference in spreading awareness. — The reader is a teacher based in Abu Dhabi.